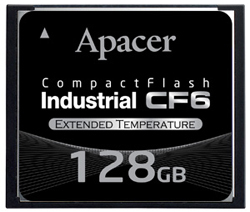 Apacer CompactFlash 6 card is compliant with the CFA 6.0 specifications. Apacer adopts the standard 50-pin connector and MLC chip featuring lower cost and higher capacity for the card. It is available in capacities from 8GB to 128GB. The data transfer mode is up to PIO-6, Multi-Word DMA-4 and Ultra DMA-6 with the sequential read/write speed reaching as fast as 105/65 MB/sec. To help data stay correct, this CompactFlash 6 memory card also supports 72-bit ECC function, wear-leveling function and S.M.A.R.T. (Self-Monitoring, Analysis, and Reporting Technology), thereby substantially enhancing product reliability.